We thought he was dead, they thought he was dead, everyone thought he was dead. How wrong we all were. 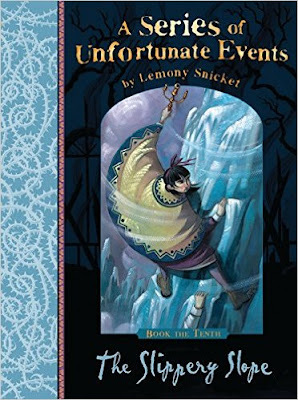 The tenth book in Lemony Snicket's A Series of Unfortunate Events. When we finished book nine we were left with Sunny being captured by Count Olaf an heading up the mountain towards the V.F.D headquarters and Violet and Klaus were in a terrible situation having had the cord connecting the caravan to the car cut, forcing the caravan to roll backwards down the mountain cliff at a great speed. We didn't know if they would survive. Well i am glad to inform you with the help of one of Violets inventions they did survive and determined to save their sister they started heading back up the mountain. While climbing the mountain the two Baudelaire's were attacked by snow gnats. what are snow gnats you ask well "snow gnats are well organised, ill-tempered insects Count Olaf explained who live in cold mountain areas and enjoying stinging people for no reason what so ever" (Snicket pg62) while trying to get away from the snow gnats Violet and Klaus hid in a cave but soon realised they were in fact not alone in this cave. It is here we meet the snow scouts and i'm sorry to say that in this group of people is Carmelita Spats I'm sure you all remember her from The Austere Academy however, all the children in the snow scouts are wearing masks so you can't see there faces these masks work as shields against the snow gnats and soon Klaus and Violet have one on too which works for them as they don't want anyone to recognise them. There is one member on the snow scouts who stands out to the Baudelaire's as he sends coded messages to them using V.F.D and the Baudelaire's can't wait to talk to him once the others are asleep. As the night wares on the Baudelaire's and the strange boy meet he tells him he knows a secret way to the V.F.D headquarters and they should follow him and a few minuet of deciding if they can trust him the three of them set off together. Meanwhile poor Sunny is being treated horribly by Olaf and his band of terrible people. She is being forced to do all the cleaning and cooking for the group and all the time is terribly worried about her siblings and has no idea if they survived. So will the Baudelaire's be reunited? Can they get to V.F.D headquarters in time? Who is this mystery stranger? I guess your going to have to read the book to find out. Well i can't say i didn't like this book because i did however, i did not enjoy it as much as i have the previous nine. For this reason i have only given it 4* on goodreads. I did enjoy the introduction of new characters especially the mystery stranger i shall call him for none spoiler purposes. I also enjoyed putting more pieces of the V.F.D jigsaw together however, by book ten i thought we would know a little more than what we do after all there is only three books left. I was also hoping we would find out more about what happened to Hector and the Quagmires but there was hardly any mention of them at all. So without any time to waste it onto book eleven i go now and of course it will not be long until the review is up.